“Pedemontana”: It’s the Italian term to define the belt of mountains just behind the flatlands; For a free flight pilot, it’s a magic word that identifies the gate to enter into the Alps sky. The key of this gate is mount Cornizzolo, that climbs with a step of 1000 meter right from the flatland. The Cornizzolo’s area offers to the free flyer the ideal thermalling conditions thanks to winds coming from the flatland toward the mountains. It is a classic nationals and international free flight competition area. The Suello’s landing, is located right nearby the ‘Cielo&Terra’ pub-restaurant and it’s a very luxury area that, thanks to the effort of the two local clubs: Scurbatt and Aeroclub Monte Cornizzolo, become a basic meeting site for pilots coming from all the world. 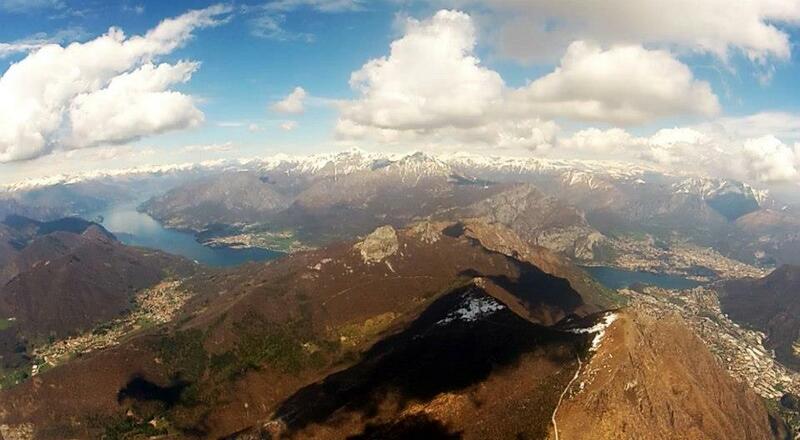 The mount Cornizzolo is 1241 meters high. On its slopes there are two main take-offs facing south, the most used is the “risparmio” located at an altitude of 1060 just near the road; the second one is the take-off “centrale”, a huge grassy ridge located to west and higher of the “risparmio”; it can simultaneously accommodate over 200 wings and is used for all the competitions, it is barely used for normal flights because to get there you need to do a 10-15 minute walk. All take-offs are very wide and safe, on grassy ground without trees or shrubs nearby, or obstacles that may create lee-side areas. From Cornizzolo it is possible to fly safely with winds coming from the south quadrants, while it is extremely dangerous to fly with the wind from the northern quadrants especially in Fohn conditions.